Like an addicted gambler who is down 2 paychecks he goes double or nothing w/pocket deuces. After spending his entire presentsy chasing DeathCare losing election after election he puts off his South Pacific trip for the same old fix. This is all or nothing as he risks making a fool of himself worldwide becoming a complete Failure. He blows off some of our South Pacific allies like he was going next door for a spaghetti feed. When he climbs onto America’s plane as the symbol of a string of losses he officially goes from world leader to loser. With his string of losses this isn’t Waterloo; it’s the Little Big Horn. Nobody on our side saw him as the messiah although we did wonder if he was as big a force as the Echo Chamber made him out to be. They were peeing down their collective legs yammering about what a great Orator and Uniter he was going to make America loved again. When you compare him to great speakers like Reagan or Lincoln who could both speak for hours w/no even notes you just have to laugh at the slight. As for World or Country Uniter, he can’t even unite his own Party after over 500 rants. He likely has his family turning to granny at this point. So he doubles down the bet going double or nada. How in the world do you set yourself up like this knowing you have to have the votes when your 20 short? It was silly enough going to Copenhagen twice to be humiliated on the World stage, this is pure obsession. Guess if you’ve hopped on those planes after Norway, Trenton and Boston it just gets easier after a while. Maybe the great Black Jack can pull an Ace out of the River, barring a long shot he looks more like a sweaty teenager than George Bush. The only George he looks like is Custer and there’s a whole lot of Injuns in those hills. Hope he brought a Change of underwear. He was brought up to love dictators like Fidel, Lenin and Chavez since it’s what true commie libs do. They know these tyrants would be loved by their masses if only evil America would give those utopias a chance to prove themselves. He has only been told the Liberal Establishment version of Cuba and Russia not the truth. He read and discussed in his Ivy League hovels the superiority of the communal system how they no longer have greed or evil capitalism oppressing the workers. He heard about all the benevolence of the leaders like Mao and how he was a godlike persona by his people. He never cared about the truth of his war on his people or the godlike persona was a figment of the Party. Mao was hated in most of the Country as were the rest of these corrupt dictators out of earshot. He knew Fidel was a great leader since all of his friends had visited him and saw it for themselves. They got the Sean Penn tour where you see the communes so well staged they should be in SoddomWood. You don’t see the Cane plantations where the people survive on 1 cup of rice a day working 14 hrs in the fields. You don’t see the horrible conditions where people if they do survive are barely alive w/o any decent food, water, sanitation or Healthcare. They don’t tour the dissident prisons or the pock marked walls. You don’t hear about the $Billion plus Fidel has in the bank from starving his people for the past 50 yrs since it doesn’t fit the tour or the Ivy League discussions. All you hear about is the island paradise and free HC. You could see while Mathews was getting his leg all tingly Premier Achmed was as phony as the Styrofoam Pillars w/his dramatic poses and upturned nose imitating Lenin/Castro. He believes he can turn this Country into his communist dictatorship as the heat gets turned up. Otherwise why would he go all in on this vote he never had in the first place? Does he really believe everybody in his Party are ready to end their careers to put in place a system endding America as we know it? Are they ready to tell all the doctors never mind your field, you all get paid the same $90K? Oh yeah, our multi-million lawyer lobby can sue you out of existence, have a nice day. He doesn’t understand the America Americans and the Free World loves. 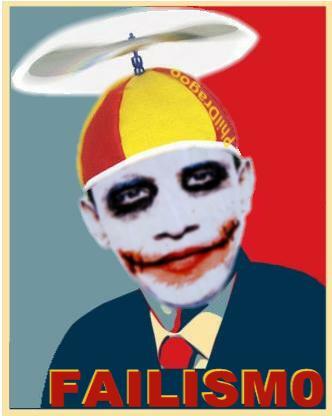 Never mind this buffoon is a pure commie, who nearly owns the Nobel for worst President to hold the office. They called Bush and Nixon partisan, this guy hasn’t gotten a single Republican vote in the last 9 mos on any major bill. It takes some real partisanship to not be able to get Collins, Snow or McCain to not vote w/you let alone Graham. You nearly have to be staked out on the Moon or somewhere in the Black Hills waiting for a Pow Wowie. Seems his two main advisors are Jeremiah Wright and Bill Ayers well maybe Sitting Bull. He has united the World in one sense; the entire World has learned to despise this arrogant newbie. For all the grief Bush got from the press for being an arrogant Cowboy, what about a corrupt Chicago thug in the shadow of Rezko/Blagovich/Daley. When he climbs those steps onto AF 1 with all those arrows sticking in his back the Champagne corks around the World will be popping as the dictator flies off to the Ash Heap of Histoir. He will be mocked and laughed at wherever he goes, not to his face of course. They’ll all wait til he turns around to bow to some Turd World tyrant as they give him a boot in his boney behind. Now he may pull this off and get his precious DeathCare passed by lying, cheating and bribing although his chances are between slim and none and slim is just leaving. He truly believes he can pull this off by speaking to his Rent-a-mob paid to listen to his tired bromides and cheer enthusiastically or whatever the card says. Being in his Marxist bubble he doesn’t believe he can be defeated by a bunch of grandmas holding signs and making phone calls. You can bet Ol Yellow Hair didn’t believe he could be defeated by a few rag tag Noble Savages either. He really didn’t need to delay his trip to make this a bigger battle than it already was, yet he’s now bet the House on a pair of Dunces.